Learning To Fly: Snow, Really ?!?!? Yes that's right yesterday in this great town I live in it snowed! Disgusting!! It's April can't we get some warm weather now? Jeez. Anyways last night my BF and I had fun playing our new Wii games! Yes we are big kids at heart. We got DJ Hero 1 &2, Guitar Hero and some game he likes. DJ Hero is pretty entertaining, I am not a gamer but I like the interactive ones. I love my Dance, Dance Revolution and it gives me exercise too so it's a win. I like the distraction of them as well. Next week will be my baby's birthday and I am losing it. I keep imagining him at one. What would he be doing? How big would he be? What would he look like? I still can't believe I won't get to live those things. I remember a few days before he died I was rocking him. It was beautiful outside and I was so happy to be with my baby. I was singing to him how we would be together forever. I can't get that out of my head. I miss him so much. I don't know what I will do when his birthday comes next week. Well I know what I will do lay at his grave and cry. I feel like I just had him, like I literally am going to go to the hospital and sit with him all day. Time to do some work now. I hope this day goes by fast. 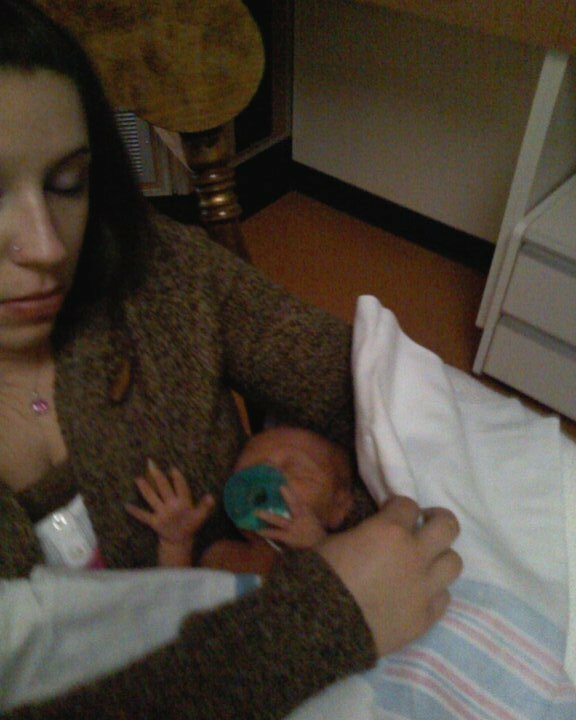 This is the first day I got to hold Gavin. My BF is not the best picture taker.